Background: Rheumatoid Arthritis (RA) is a devastating disease characterized by continual addition of leukocytes and T cells within the articular cavity causing inflammation and cartilage destruction. Withania somnifera is one of the most precious medicinal herbs, reported to have antioxidant, anti‐inflammatory, and immunomodulatory properties. 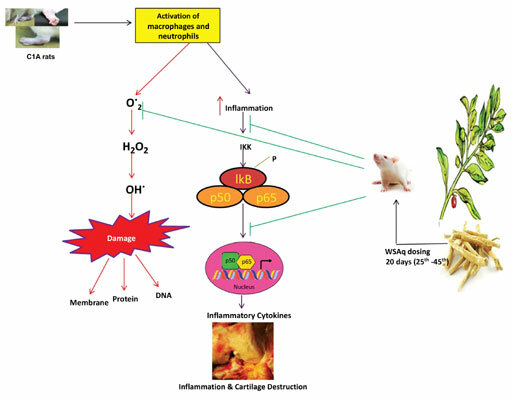 Objective: The purpose of this study was to evaluate anti-inflammatory activity of aqueous extract of Withania somnifera roots (WSAq) in Collagen Induced Arthritic (CIA) rats. Methods: To achieve this, we assessed the level of inflammatory cytokines such as Tumor Necrosis Factor (TNF)-α, IL-1β, IL-6 and IL-10 in CIA rats. Further, transcription factor, oxidative stress parameters and CD+8 expressions were also analyzed in CIA rats. Results: Arthritic rats showed a greater increase in the levels of pro inflammatory cytokines such as TNF-α, IL-1β, IL-6, transcription factor NF-κB and a decrease in IL-10 concentration than controls rats. Oral administration of WSAq at a dose of 300mg/kg.wt. (WSAq300) appreciably attenuated the production of these pro inflammatory cytokines. This anti-inflammatory activity of WSAq300 might be partly mediated through an increase in the secretion of IL-10 and inhibition of NF-κB activity. Further, arthritic rats also show increased oxidative stress as compared to control rats. This increased oxidative stress in the arthritic rats appears to be the outcome of both an activated pro-oxidant and a poor antioxidant defense system. Treatment with WSAq300 strongly ameliorates all these ROS parameters significantly to near normal. Additional, metalloproteinase MMP-8 levels were also measured and found to be increased in CIA rats, which after treatment with WSAq300 came down to near normal. Conclusion: From the above results, it can be concluded that the use of WSAq300 may be a valuable supplement which can improve human arthritis. Collagen induced arthritis, inflammation, joint destruction, oxidative stress, rheumatoid arthritis, Withania somnifera.